Many are unaware of the powerful impact of the thyroid on numerous bodily functions and overall wellness. However, those who do recognize its importance have likely experienced dealing with significant, life-changing thyroid issues firsthand. 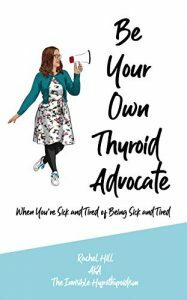 Rachel Hill, thyroid advocate and author of Be Your Own Thyroid Advocate: When You’re Sick and Tired of Being Sick and Tired, is one such person. Hill is also one of the relative few who suffer from lifelong thyroid dysfunction but have achieved a renewed quality of life. With an intimate understanding of thyroid disease, Hill, in her book, accurately describes the many challenges of living with thyroid disease and shares useful information in the form of personal experience as well as scholarly reviewed research. Be Your Own Thyroid Advocate: When You’re Sick and Tired of Being Sick and Tired is a compilation of personal stories, tips, and research covering virtually every aspect of thyroid health. Areas covered include physiological function of the thyroid, treatment options, how to communicate with and find the right practitioners, everyday practices to support the thyroid, and much more. The majority of this information is delivered through Hill’s retelling of her journey with thyroid disease. Readers are given the opportunity to have a personal and in-depth look at the frustrating, confusing, and challenging experience of having a thyroid condition. Hill’s narrative spans from her childhood of living with an undiagnosed thyroid condition, eventual diagnosis, difficulties with treatment, and ultimately what steps she took to achieve greater thyroid wellness. Readers who have thyroid issues will likely find that her story shares many similarities to their own. The primary thrust of the book is to equip readers with the information and tools they need to become their own patient advocate. Although much of the book is centered around personal history and anecdotal experience, there is a wealth of practical and well-researched information that readers can utilize to become better-informed of virtually every aspect of thyroid wellness. A significant emphasis is also placed on individuals taking responsibility for their own thyroid health, which as suggested by Hill, may require disagreeing with one’s practitioners and in some cases the medical community at large. It is important to note that the information compiled and presented by Hill is done so predominantly through the lens of functional medicine. Therefore, many if not most medical practitioners may not be aware of, follow, or agree with the arguments contained in the book. Readers may be surprised by the strong criticism of typical or traditional medical practices. But, as the author explains, it is often the case that the current “one-size-fits-all” approach to thyroid care is not effective for many patients. This further supports Hill’s thesis that currently, thyroid wellness requires patients to educate themselves and take responsibility for their own thyroid health. Although much of Hill’s experiences with doctors, as described in the book, paints them in a negative light, she does make it a point to emphasize the importance of proper medical care. Hill argues that finding a doctor who is receptive to information presented in the book is an important component of greater thyroid wellness. The resources and suggestions made by Hill are given in the hopes that readers will be able to use them to find the ideal practitioner for their unique situation. Hill’s genuine and forthright tone makes comprehension of the complex and potentially confusing topic of thyroid function, treatment, and research, easy to understand without diluting its value. The retelling of Hill’s personal story is punctuated with impactful pieces of information that are useful for anyone suffering from thyroid disease. The depth of information and manner in which it is presented makes Be Your Own Thyroid Advocate: When You’re Sick and Tired of Being Sick and Tired an effective introduction and guide to thyroid disease as well as an uplifting and motivational tool. Readers who have only recently been diagnosed with thyroid dysfunction, have never heard of thyroid disease, or are well-versed with the thyroid, will all be able to get value out of Hill’s comprehensive compilation of information and entertaining delivery. Those looking to gain a better understanding of thyroid disease and the many elements that accompany it will find that Be Your Own Thyroid Advocate: When You’re Sick and Tired of Being Sick and Tired is an excellent place to start. Furthermore, by utilizing the tips, suggestions, and general thyroid information included in the book, readers should be able to better empathize, understand, and support those suffering from thyroid dysfunction. Perhaps the utilitarian component of Hill’s book is the exceptional collection of additional resources that readers can use to further increase their understanding of the thyroid on the journey to becoming their own thyroid advocate. The references provided include non-profit organizations, thyroid support groups, patient advocates, online communities, thyroid specialists, and others. These resources welcome readers to the global thyroid community. After reading Hill’s book, thyroid patients will realize that even though it may seem that their disease isolates them, they are truly never alone. Regardless of the motivation, those interested in learning more about the thyroid will find that Hill’s straight forward and endearing delivery makes the exhaustive collection of information contained in Be Your Own Thyroid Advocate: When You’re Sick and Tired of Being Sick and Tired is easy to understand and a pleasure to read. Those who believe they may have a thyroid condition, have already been diagnosed with a thyroid condition, or have a friend or family member with a thyroid condition, will benefit greatly from reading Be Your Own Thyroid Advocate: When You’re Sick and Tired of Being Sick and Tired. To order this amazing thyroid resource visit TheInvisibleHypothyroidism.com.